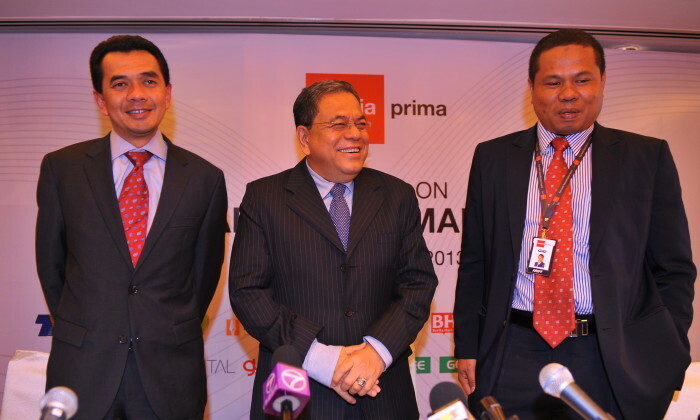 Media Prima recorded a growth in profit after tax and minority interest (PATAMI) of 3% for the year-to-date (YTD) September 2012, which stands at RM136.73 million, compared to RM132.60 million in the corresponding period last year. Net revenue for the third quarter of 2012 grew 5% to RM437.21 million compared to RM417.47 million recorded for the same period last year. Media Prima’s Television Networks – comprising TV3, ntv7, 8TV and TV9 – remains as one of the main revenue contributors for the group. TV3 continues to be the nation’s No 1 free-to-air (FTA) TV station, with an audience viewing share of 26% on both FTA and pay-tv. Overall viewership recorded by all four Media Prima TV stations stood at a commanding 45% from more than 100 TV channels offered in the country (Source: Nielsen). NSTP registered 2% growth in revenue for the third quarter of this year, from RM212.34 million in 2011 to RM217.11 million. Harian Metro is currently the most read newspaper with a growing daily readership close to 4 million. The group’s outdoor media registered a revenue growth of 6%, with increased contributions from expressway and digital media. Media Prima’s Radio Networks – comprising HotFM, FlyFM and OneFM – recorded 4% revenue growth, with HotFM and OneFM achieving 5% revenue growth respectively. HotFM is the No 1 radio station for the average listeners for the under 25 demographic (Source: Nielsen Radio Audience Measurement, Wave 2. 2012). Media Prima’s digital and online media division registered an overwhelming revenue increase of 65%, a remarkable growth from RM6.9 million in 2011 to RM11.5 million this year. Tonton, launched two years ago, has 2.5 million unique registered users. “Our investments [in digital media] are beginning to yield the desired results. The division will assume a strategic role in optimising the role of our core platforms through Tonton, our e-newspaper and other online digital products,” he said. Global brand consultancy agency FutureBrand has appointed former Thinkscape CEO and partner Zayn Khan as Asia Pacific CEO, based i.. Working closely with INFINITI’s Singapore team, WE will develop a comprehensive media plan to maintain momentum during the eight-w..